Vinaudit Report Review - Is Vinaudit Report a Scam or Not ? 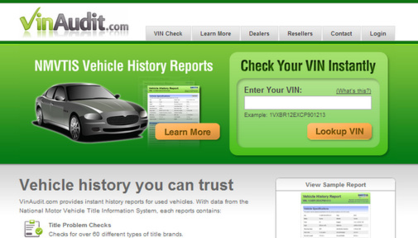 VinAudit is special online service that is providing trusted vehicle history just for 10 dollars. Hello everyone, Milan Chymcak here and I just tested VinAudit, but before I will try to give you my honest VinAudit review, I have to first tell you what you will exactly recieve in their report, how this VinAudit service works and what you can really expect. Vinaudit will provide you almost instant your report, so you don’t have to wait at all. So you will get instant history reports for vehicles – obviously for used cars. Report that you will recieve is really great written, so you will get all information that you will need. So there is my honest VinAudit review and if you have any question about this Vinaudit vehicle reports service, then please leave a comment below this review and I will try to help you as fast as possible. So what exactly you will recieve inside Vinaudit history report ? (By the way you can check one screenshot of Vinaudit report below or you can check their official VinAudit report on their website) So you will get title problem checks, then it will check for different types of title brands, then it will check if there is any junk, salvage, and total loss record or if there was any accident. And each part of this report is really great explained, so you will really get every information about that vehicle. Then you will get Odometer checks, then you will get report with related activities of that car – is there is any related accident and so on. 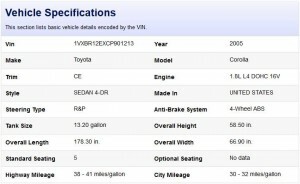 Then you will get detailed historical title registrations and detailed vehicle specifications. And using this Vinaudit vehicle report service is really easy – all what you have to do is insert VIN and it will automatically generate professional report you – just for 10 dollars. Well I think it’s good price. So what else you will get in VinAudit vehicle report ? When I said that you will get everything that you need in vehicle report, then I mean that you will also get recommended sources and services for finding out more about this vehicle. So it will be really easy to find even more information about your vehicle. Of course you will get all information about vehicle like tank size, length and so on, but I just wanted to show you what all you can get in this Vinaudit service. Well my opinion is that this is really professional and cheap vehicle report service. Just for 10 dollars you will get all information about your (future ?) vehicle. Using this VinAudit service is really simple and as I said I recommend you to check their sample reports for free, so you will know what you will recieve. And if you purchase this VinAudit report through us (link is below this review) I will send you our bonuses for free (50 dollars value). Anyway I hope that you found this VinAudit review useful and helpful. Is Vinaudit Report a Scam ?